He’s back! Tyler Johnson, who was the NHLPA’s PPOTN on April 24 (courtesy of a three-point performance against Detroit, including the OT winner), netted a hat trick, the first in team playoff history, in Game 2 of the Eastern Conference final on Monday night. Down one game to the New York Rangers, Johnson put on a clinic at Madison Square Garden. He scored a short-handed goal with the Lightning down two men, a power-play goal and an even-strength marker, to give him a league-leading 11 post-season tallies. Passed over in a trio of NHL drafts, the diminutive forward has been simply sensational for Tampa Bay in the regular season and playoffs. STAT PACK: Johnson scored his three goals on six shots. He also had three blocked shots in 16:58 of ice time, taking 25 shifts. STREAKING: In 2011-2012, as a member of the Norfolk Admirals of the American Hockey League, Johnson went on a 13-game scoring streak, including consecutive two goal games, the longest streak by an AHL rookie in more than six years. It earned him AHL Player of the Month honours for March of 2012. AND THE AWARDS GO TO…: Johnson was selected as the Best Overage Player, Top Defensive Forward, Best Skater, and Top Faceoff Man, finished second in Most Valuable to Team, and third in Most Accurate Shot in the Best of the West 2011 poll. TROPHY CASE: Johnson has a Memorial Cup win (2008, Spokane) and a Calder Cup (2012, Norfolk) to go along with his World Junior gold medal. In 2013, he won the AHL’s Willie Marshall Award as the leading goal scorer for the regular season. In that same year, he was honoured with the Les Cunningham Award as the AHL’s regular season MVP. A REAL GENTLEMAN: In 2011, Johnson won the Brad Hornung Trophy as the WHL’s most sportsmanlike player. HONOURABLE MENTIONS: Ben Bishop (35 saves) stood tall in the Tampa net once again. 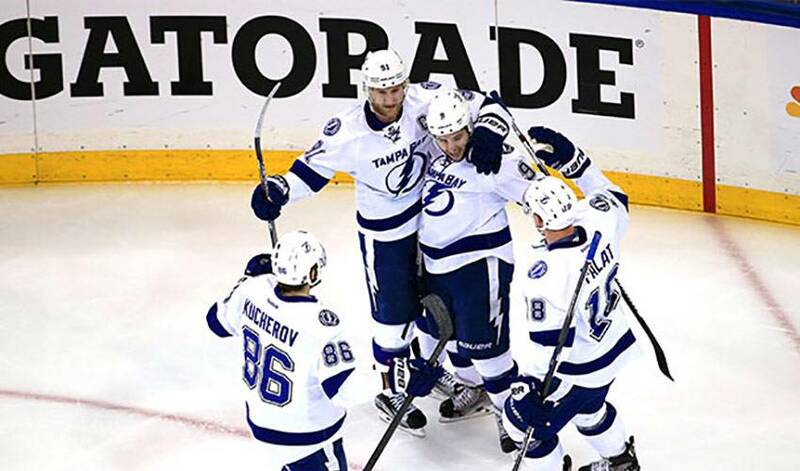 Alex Killorn (2 G, 1A), Nikita Kucherov (3A) and Steven Stamkos (1G, 1A) all had big games for the ‘Bolts. Chris Kreider had one goal and one assist for the Rangers.